The Aroma Magic Hair Serum is enriched with the antioxidant and astringent properties of mandarin and rose essential oils, which strengthens hair roots and provides instant shine and bounce. Jojoba oil hydrates hair from the inside of the hair shaft, adding elasticity and softness. Vitamin E and aloe vera gel help reduce inflammation and repair damage to the follicles and restores pH balance of the hair, making it soft and silky. Explore the entire range of Hair Serum available on Nykaa. 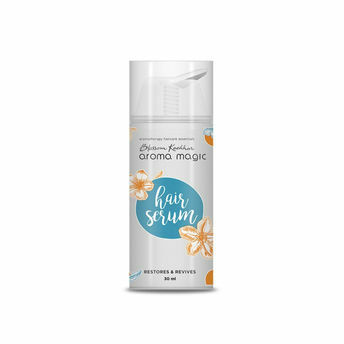 Shop more AromaMagic products here.You can browse through the complete world of AromaMagic Hair Serum .